I was going home after work when a friend messaged me with Sirisena’s latest statement. Having read the caption, I read and rewatched it. The caption hadn’t prepared me enough me for what I had just watched. I’m not going to go into detail or dwell into what was said because all of us would have seen it multiple times by now. Let me first reiterate that this is not a statement supporting Ranil Wickremesinghe. I’m no fan of him. 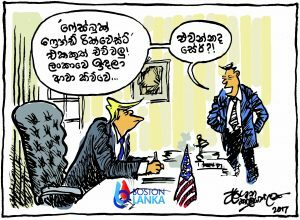 Neither am I a fan of Mahinda Rajapaksa or you, Mr. President. I’m fed up of the political system that is easily bought and sold to the highest bidder these days. Back to you Mr. President. You could have attacked Ranil W on his policy decisions or his inaction during his tenure. But no, Mr. President, the almighty protector of this nation’s culture of two thousand and five hundred years decided to stoop lower when we thought you couldn’t go any lower. 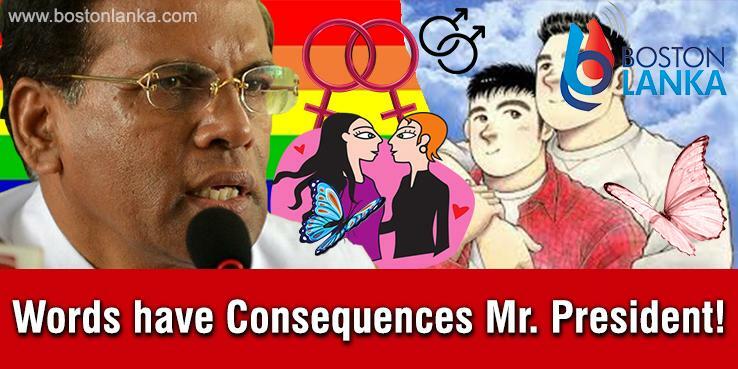 You decided to call Ranil a සමනළයා, a derogatory term to address someone who’s gay. You referred to Ranil and his gang as his සමනළ කල්ලිය, a swarm of butterflies, because when you have ways to demean people why not use all of what’s possible casting civility aside. Our culture is supposed to be one of tolerance not one of intolerance and ridicule. Words have consequences Mr. President, people in this country voted for you to protect the rights of every citizen. Not just a certain group of people. But let me reiterate, every citizen. I didn’t vote for you because I was too young to have voted for you when the presidential election was held but if my memory proves right you were elected on a mandate to safeguard the rights of EVERY citizen. But no, you decided to go and bash a whole group of individuals because of a grudge you hold against a previous political bedfellow of yours. It’s sad to see a President that should represent every one of the country’s citizens sink this low. I’m young. Yes. But I’ve gone through the bullying. The teasing. The endless nights crying and cutting myself because I hated myself, because of statements and ridicule that the society in general directed at me. I’m a “grown-up” now and a proud, strong butterfly. But let’s remember that there are other young people, much younger than me who’ll look at your comments and the people cheering you on and egging your statements on. Drawing pleasure from your ridicule of the perceived sexuality of RW and his advisors and ministers in his inner circle. The very act of ridiculing someone based on their sexuality is downright appalling to say the least. We need to make Sri Lanka safe for everyone. That’s how we grow. Stronger. Together. But your words today will have proven to the younger generation that Sri Lanka isn’t open to accept them. That their own President sees them as inferior. And their sexuality as a detriment to hold positions of power. Lest we forget Alan Turing, Tim Cook, Ellen De Geners, Leo Varadkar, Arthur C. Clarke, all butterflies, සමනළයො in your words Mr. President, all exemplary individuals in their own right, trailblazers for young LGBT+ people around the world. It’s sad that young people here will always have to look outside for inspiration because it doesn’t look like anytime soon that they will be able to fly freely, true to their self. Certainly not with a President who ridicules them for who they are. God knows when we’ll be able to tell our kids that they will be loved no matter what and to be who they are. The previous government wasn’t any better for LGBT+ individuals. They didn’t actively engage in bettering their social stance but at least they didn’t use the LGBT+ community as a punchline to jokes in front of the whole nation. Thank you Mr. President for your remarks for it’ll only make me stronger. To fellow young LGBT individuals, don’t let this affect your perception of yourself. You are as valid as any other human being capable of achieving everything you dream for yourself. Don’t let words stop you in your tracks. Always keep marching forward. That’s how we’ll all become stronger.